I thought I'd start up a thread for folk to review, comment or recommend particular Year's Best anthologies of SF, fantasy or both. This could include specific volumes edited by Dozois, Strahan, Hartwell, etc., or older ones that predate the current crop. This will contain posts that would probably fit into the Short Story thread I guess, but that seems such a catch all, and it seems to me there could be room for more short story threads. Well written and engaging – good dark science fiction. This was made into a film last year (I’ve not seen it). Hugo nominee and Locus Award winner. Pretty good, an interesting fantasy tale, set in our modern world. Probably could be classed as Magical Realism, but enjoyable. WSFA Small Press Award. I quite liked this, as it riffs on Asimov’s laws, and is pretty hard SF, which I like. Quote funny in places, though it’s a possibly too ‘clever’ to be great. I quite liked the story in a way, but it’s hardly fantasy or SF. Perhaps it’s mildly weird fiction – is that a genre? A gentle pleasant enough tale though, well told. This would be classed as future fantasy, I suppose. It didn’t do anything for me, though it didn’t offend me either. A fantasy tale set in Purgatory, on a trip to take a soul to Hell. It’s pretty grim, and well told. I didn’t think it would be for me, but it was quite engrossing, and sticks in the memory. A cracking SF story. I won’t give away the plot, but it’s very well told. I’d not read Williams before, and will now seek him out; the man can tell a story. Highly recommended. From one cracker straight into another. This is a modern fantasy, set in small town America. The imagery and ideas in the story blew me away. One of the best SFF short stories I’ve read recently; it reminded me of Stephen King. Quite good –this is ‘other world’ fantasy, as opposed to earthbound magical realism. The imagery is rather striking and Rosenbaum writes well. World Fantasy Award Nominee. Modern day fantasy again (there seemed to be a preponderance of that in the anthology, I was hoping for a little more SF). Powers writes well of course and tells an engrossing story. I enjoyed it pretty well. This is the prequel novelette to Bacigalupi’s The Windup Girl, published two years later and winner of the 2010 Nebula Award. The story is pretty good (and the Windup Girl actually appears toward the end, in a minor role). I’m not sure its SF, exactly, its dystopian future fiction, but that doesn’t matter. It’s very well done and I enjoyed it. Hugo Award Nominee. This is another story that I would have thought I’d like less than I did. My misgivings going in were that it seemed to have very little SFF connection. It turned out there are ghosts in it though, so its weird fiction or magical realism again (lots of that here). However, it’s beautifully told, and I think Ryman spins a we’ll told story, so it’s recommended. Hugo & Nebula Award Nominee. I like Wilson’s style, and this is a pretty good SF story. It’s a slightly complicated premise, so I won’t try and summarise, but it’s a solid story. Theodore Sturgeon Memorial Award winner. A ghost story, featuring a girl, a boy and a lighthouse. Fine, if you like ghost stories. It’s not scary, it’s gentle, but it’s well told. I’m not a huge ghost story fan. I was looking forward to more SF by the time I reached this one. It was pretty good, but not great. Hugo Award Nominee. There were lots a nice ideas and imagery here; much to admire. The end fell a bit flat for me, but others may like it. A strange mix of wizards, magic, trains and other semi-modern inventions. Not earth, I’m guessing. Three things wrong with this one: pretentiously written, neither SF nor fantasy, uninteresting story. To be avoided. Old-school SF, Willis is riffing on Heinlein’s juvenilia short stories with this one (even calling the space station, the Robert A. Heinlein). It’s well told and especially engaging. I’d have given it 4 stars, except that the clear use of Heinlein’s style and type of plotting invites direct comparison, and whereas Heinlein told his juvenilia tales with genuine intent, this is clearly done as an amusing pastiche, and it takes away from it somehow. Nice idea though. Not a particularly bad story, but it sets up as a good dystopian SF setting, and then has a weird fantasy end that seems incongruous, unexplained and inconsistent with the world in which its set. Wolfe must have been about a hundred when he wrote this. Okay I just checked, he was only 76. It was good to see story in here from one of the old grandees of SFF. Unfortunately for me, it wasn’t SF, it was a rather grisly horror story. A second story from Rosenbaum. This is big idea SF, in the sense that its told from the perspective of the makers of universes. Not sure how successful it is, for me. Hugo Award Nominee. This is set in McDonald’s near future India, in which he’s set a number of stories. It wasn’t my cup of tea at all though, and I struggled to read it and ended up skimming. Hugo Award Winner. Overall, I was quite pleased with this collection – it certainly contained some stories I thought were very good. The mix of genre stories was probably not how I would have weighted them, as I particularly enjoy SF, and I like my fantasy on the exotic/epic side of things, rather than earthbound magical realism, or weird fiction. However, I really enjoyed a lot of stories I might not have expected to, so maybe my tastes are not quite what I thought. A good example is The Night Whiskey. It’s a Stephen King-style weird fantasy, but it was excellent. I must credit Strahan for selecting stories that were very well written. With only one clear exception, I enjoyed the writing, and one bad miss in close to two dozen stories is a pretty good hit rate. 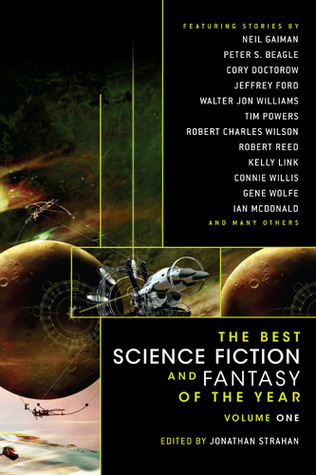 An added bonus in reading anthologies is that you discover authors you didn’t previously know that you want to explore more: from this anthology I feel I’ve discovered (for me) Walter Jon Williams and Jeffery Ford. One more point I have to make: The cover of this volume (and indeed all volumes in this anthology series) shows us a space ship in outer-space. When you pick the book up you might feel this suggested there would be a lot of SF in it, and maybe even, oh I don’t know, stories set in far flung reaches of space or involving space ships, or set outside our solar system? However, there are no stories like this in the entire book. Only two space ships appear in the whole anthology, and they are both in the solar system. In fact, we never leave our solar system and all but a few stories are set on terra firma. Now, a good story doesn’t require that we get on a space ship or leave the solar system or meet bug eyed monsters, but the covers are disingenuous, so I mention it. Of course, enjoyed the book, so not sure how much it matters. I have Volume 2 on my shelf, so perhaps we’ll see how 2008 compared to 2007 soon. Great idea for a thread. I was just thinking about diving into some of those. Year's Bests were pretty scarce on the ground for much of SF's history: Bleiler and/or Dikty covered mostly the 50s and Merril came along in the late 50s and most of the 60s. Her Best of the Best (which selected from her first five volumes) was probably the first SF anthology I ever read. Asimov and Greenberg edited a series of "retro-Annuals" in the 80s and 90s which covered stories from 1939-64. That fits in with Wollheim and Carr starting theirs before going their separate ways around '71. Carr covered the 70s and very early 80s the best, I think. Del Rey had an annual series in the early 70s that Dozois took over in '76 at #6 and ending around '81, I think. He really hit his stride with the still-running The Year's Best Science Fiction series which covers '83 or so to the present. And there are lots of other editors in the past (such as Hartwell) and still ongoing (like your Strahan there and Horton and the newer Clarke series and newer-still Afsharirad series (though that restricts itself to military/adventure/space opera-type SF). Not to mention all the fantasy and horror anthologies which, while less popular as annual anthologies than the SF ones are still a big component of it all. Exactly - a huge number of authors that I have on my shelves came from finding their works in magazines or anthologies and the year's bests are at the top of the list in terms of finding great stuff to get into. On both that point and on what you say about "The Night Whiskey" - I'm mostly an SF guy, too, but I came across Jack Cady's "The Night We Buried Road Dog" in Dozois' 11th annual and loved it even though it's a fantasy/horror type story and when Underland Press started putting out retrospective collections of his stuff, I picked up a couple of his collections. Still haven't read them (of course) but I will Someday! Definitely a thread to keep an eye on. I've bought Year's Best Weird Fiction (mostly because I love the cover art) but am yet to read it. I wish I wasn't such a slow reader! I've recently finished an anthology I didn't enjoy very much (not SF&F-specific), so I won't mention that one. I've added two to my reading list. Yes, but they are not best of collection 'annuals' so don't belong here really. Oh well - the opening post didn't read that it was only meant to be "best of" anthologies to me. The ones that got me into SF were the Best SF series published by Faber & Faber, especially numbers One, Two and Three, plus the best of collections from the magazines F&SF, Galaxy and If! These are all mainly from the nineteen sixtys! Thank you Nuneaton Library for helping to feed a young boys dreams, and sometimes nightmares!!! Gathering only 99p until News Year's Eve!